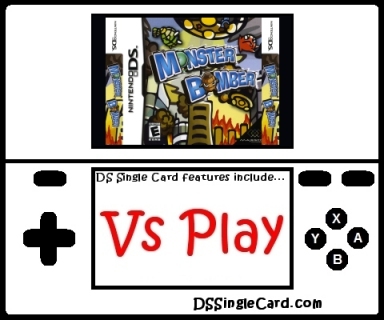 The basic setup of Monster Bomber is simple and easy to maneuver through, and it was helped by the fact that it was an earlier Nintendo DS game, being initially released alongside the Nintendo DS Lite version of the system (in Japan). "DS Download Play" is right on the main menu. The opening credits aren't too long and the download time is about average. The on-screen buttons are large and have clearly defined. The labels are large, legible, and they make sense. The basic structure of Monster Bomber's control scheme makes it simply impossible to play the game with any kind of button controls; it requires touch screen controls. This isn't necessarily a bad thing, but the touch controls take a lot more getting used to than they should, which may extend the learning time beyond some players' patience, but not all. There are two issues with the touch screen controls. The first issue is that they are a over sensitive. For a game that involves a dragging mechanic and a throwing mechanic, and where there are such rigidly defined borders, accidents where players drag into those borders and have to start over are bound to happen. The second issue isn't with the touch screen controls themselves, but rather the location of the screens. Throwing a ball in a diagonal direction from the Shooting Area doesn't always send it to where you think it will. In playing, it seemed like the programmers (not working on a Nintendo DS system, of course, but rather a computer) forgot that people playing the game on a Nintendo DS will have a gap between the two screens, or that they forgot how big the gap is. When playing the game, players automatically try throwing the ball where they visually see the monsters at... and that's above the gap between the two screens. After learning to trust their instincts, players will stop looking at their angle and will pick up the "new" aiming instinctively, but the adjustment can be difficult for some people. Graphically, the look is rather simple, completely in 2D. The monsters are drawn comically and are easily distinguishable. Unfortunately, however, the game's mechanic is entirely based on color and colorblind players may find it impossible. Audibly, the game's sound effects add to the mood the game wants to portray, but the sound effects don't really add to the playability in any way when the game really starts to get going; the focus is elsewhere and stopping to hear and interpret the similar-sounding sound effects can be a problem. Feature-wise, the main game is playable in a Vs format, meaning it has additional multiplayer pick-up items. Any level unlocked in the single-player game. Despite it's low review score here, Monster Bomber is not a terrible game. There are a lot of things that take time to get used to, but it's a unique action puzzle game that can be fun. The game defintely plays better on the larger screens of the DSi series. I've played the game several times before I began this review in single-player mode on my own, and the game really is nearly identical to the single player experience: something that's far too rare these days. This is far from Taito's best development work, but it's also not their worst. It's playable, and some people really take to it. I recommend giving it a shot (via rental) before deciding if they want to try and track down a copy or not. Change the game so that when a ball is dragged onto another Stock Pallet, it isn't shot automatically, & is held onto until it's brought into the Shooting Area. Fix the game's Aimed Shot mechnic so that the peoper gap between the screens is accounted for. Encorporate a "Colorblind Mode" where monsters have different lines crossing over them indicating their color (with matching lines in the Stock Pallet). Alter the sound effects to sound more distinguishable.